We tend to share lot of personal information on Facebook like: listing of family members, cousins, displaying current relationship status. In the timeline profile format of Facebook: you can easily add, change or update relationship status displayed on your profile page. It should be noted that you can only list a confirmed friend in your relationship status. This means, that person also needs to confirm that you are in a relationship together before Facebook displays your new updated relationship status on the profile page. 1. Open your profile page once you are logged into Facebook. After login, just click your profile name at top left part to open the default Facebook profile page (now displayed in the timeline format). 2. Then click on ‘Update Info’ button at top right part of the Facebook profile page. This will open ‘About’ page of your profile showing all the setting details. Scroll down to bottom of the ‘About’ page and look for ‘Relationships and Family’ section. 3. Click on ‘Edit’ button at top right part of the ‘Family’ section. 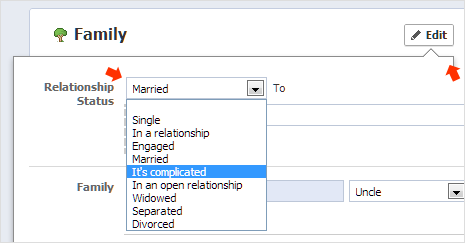 Then select ‘Relationship Status’ from the drop down box among options: Single, In a relationship, Engaged, Married, It’s Complicated, In an Open Relationship, Widowed, Separated, Divorced. 4. Then type name of the person with whom you want to mention the relationship status on Facebook. You will automatically see profile name options as you type name of that special person. Once you update this, that person will receive alert message to approve ‘relationship status’ request. Once approved, your new relationship status will start showing on the profile. 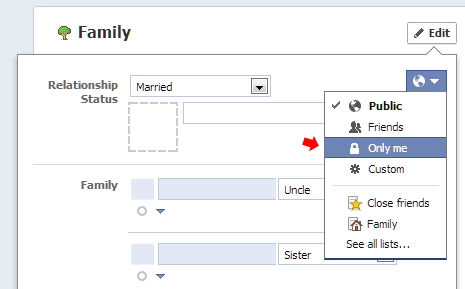 You can easily hide your new ‘Relationship Status’ from other Facebook users. While updating the relationship status, click the “audience selector” [the globe button] and select ‘Only Me’ option. New relationship status will not show to other users. If you want to display new relationship status to selected group of Facebook friends, select ‘friends’ option or select ‘custom’ option and then manually select group of Facebook friends. This is the best place to share the personal information to our near and dear ones..